Wi-Fi platforms have traditionally focused on peak speeds. However, evolving usage scenarios (such as stadium and campus environments and even households with multiple Wi-Fi devices) have led to the appearance of standards aimed at solving the 'capacity' problem. We saw 802.11ac Wave 2 devices come to the market over the last couple of years. MU-MIMO on the downlink side was one of the first features to address this capacity issue. 802.11ax is set to become the next major leap in Wi-Fi technology. The last major introduction (802.11ac) has since been complemented by 802.11ad in the 60 GHz band, but, 802.11ax is the technology that will provide performance benefits in the 2.4 GHz and 5 GHz bands. Quantenna was the first to announce a draft-802.11ax-compliant access point radio solution back in October 2016. It was a 12-stream solution with 8x8 in the 5 GHz band and 4x4 in the 2.4 GHz band. They followed it up with a CES 2017 announcement for their mid-range solution (8-stream with 4x4 in the 5 GHz and 4x4 in the 2.4 GHz bands) targeting the same market. 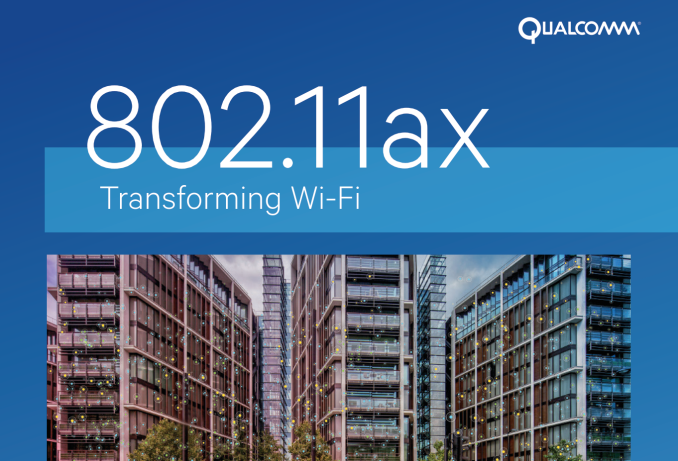 Today, Qualcomm has become the second vendor to announce a 802.11ax solution. Unlike Quantenna's focus on the access point side, Qualcomm is announcing products for both the AP and client device markets. Similar to the Quantenna QSR10G-AX, the IPQ8074 is also a 12-stream solution (8x8 5GHz + 4x4 2.4GHz). However, in addition to the baseband, it also integrates a network processor. On the baseband side, the IPQ8074 supports 80 MHz channel width and has MU-MIMO for both uplink and downlink. In addition to the baseband radios, the IPQ8074 also integrates a quad-core Cortex-A53 (running at up to 2 GHz) and a dual-core network accelerator for deep packet inspection and other such applications. interfaces similar to the existing IPQ solutions (for USB and PCIe lanes) are supported. On the network side, a network switch with support for up to four Gigabit MACs is also available. The IPQ8074 SoC also supports NBASE-T, with up to two 10G interfaces supported. The SoC is fabricated in a 14nm processor. Qualcomm expects that access points using the IPQ8074 SoC can be powered via PoE. The QCA6290 client device platform is a 2x2 802.11ax solution with concurrent dual-band operation. IIt is fabricated in a 28nm process. The platform supports the 802.11ax power saving features along with some proprietary Qualcomm extensions for better battery life. Qualcomm expects the QCA6290 to be integrated into computing systems rather than being a part of a USB WLAN adapter. The QCA6920 interfaces with the host system via a PCIe 2.1 x1 link. Qualcomm didn't provide us with concrete power consumption limits (such as the 15W PoE budget for systems based on the IPQ8074) for cards integrating the platform. Qualcomm claims that their proven MU-MIMO leadership experience as well as their expertise with OFDMA / LTE (based on their cellular background) gives them a edge when it comes to 802.11ax solutions. Note that existing networks with 802.11ac MU-MIMO devices can also benefit in a 802.11ax network. Traditionally, Qualcomm's main competition in the Wi-Fi space has been Broadcom. However, since the acquisition by Avago, things have been relatively quiet and no 802.11ax solutions have been publicly announced by them. Marvell does have 802.11ax solutions in their roadmap, though they weren't willing to discuss specifics when I talked to them at CES 2017. In any case, Marvell's focus has been more on the enterprise space. The main competition (based on announcements from other vendors) is Quantenna's radio-only solutions. Based on the quotes in Quantenna's launch release, it appears that they are teaming up with Cavium Networks for the network processor component. This works well in the enterprise space and for specific service provider use-cases. However, most market segments prefer the complete platform (radios and network processor) from one vendor. The platform might be either discrete radios and NPUs or a SoC with integrated radios like the IPQ8074 being launched today. The integration of the radios and NPU into a single chip will definitely make it simpler for router / gateway vendors to bring a product into the market. Another aspect to consider is the unified memory space offered to both the baseband and the network processor in the case of the integrated SoC - as the PHY rates from the radio move beyond the gigabit barrier, this becomes important for the performance and energy efficiency of the system. From an adoption perspective, it is good to see that both AP and client platforms being launched simultaneously. Qualcomm expects routers based on the IPQ8074 SoC to come to the market before the end of the year. Client devices using the QCA6290 are expected in 2018. Last time I checked the most reliable and strongest signal strength for WiFi are found in wireless access points, which are just round dish shaped things that are stuck onto a wall or ceiling. These don't have externally mounted antennas, they're internal, and yet they still have better reception and signal strength. I work in IT, have for years, run a WISP. 90% of your "round dish shaped things" have 2dBi antennas that may or may not be in a good location for service. The external antenna gives you the option to arrange the antenna a bit (often you'll find having one horizontal, one vertical and one at a 45* angle is best in a 3x3 system). The little plug in, all in one AP's your talking about are done that way with aesthetics and price as the primary drivers in that design. There are better models with higher power but they're almost all limited to a 2dBi antenna.